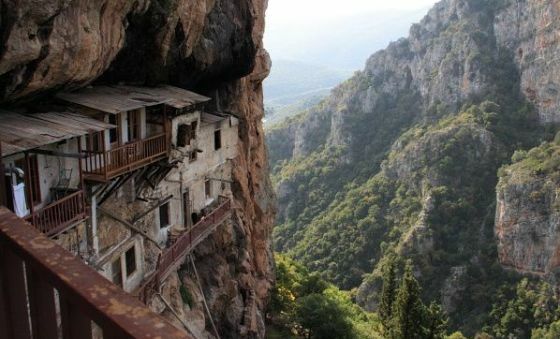 The Baptist Monastery or Monastery of John the Baptist is located between the villages of Stemnitsa and Dimitsana, down by the ravine of the river Lousios. According to some sources, it was built around 1167. Scrambled on the side of a rock face, it is a sight quite breathtaking for the unsuspecting visitor. At the car park there is a little church jutting out above the ravine. From there, walk for about 20 minutes downhill to visit the monastery. Since access to the monastery requires walking, appropriate shoes are well advised. There are now only 6 monks left in the monastery from what used to be 40. These monks don’t practice a vow of silence as you can hear them chattering from below especially around lunch time. On some occasions, visitors and pilgrims can stay overnight. From the balcony of the monastery, visitors can admire the rugged beauty of the gorge accompanied by the constant sound of the running and impetuous waters of the river. Today, the monastery operates a workshop for painting and the sewing of holy garments. There is also a remarkable collection of some 1,000 books. Near the monastery are the excavations of an ancient hospital built in honor of the ancient Greek god of medicine, Asclepius. The Baptist monastery is considered to be one of the most beautiful monasteries in the Peloponnese.